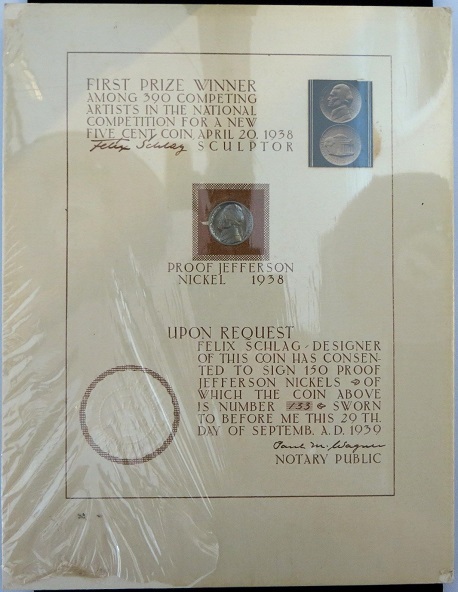 A look at Jeffersonian rarities, including 1938 first bags given by Henry Morgenthau as mementos, 1938 specimen strikes representing the first three Jefferson nickels to be produced, and Schlag's framed certificates was originally published under the title, Cingular Certificates, Souvenir Cards & Proof Nickels, in the January 2018 issue of The Numismatist. The gallery below displays information pertaining to the 150 autographed, serialized, and notarized proof displays made by Felix Schlag in 1939. You may also view the FULL REGISTRY HERE. Items included represent pieces we have been able to collect information on; as you will see there are MANY holes to fill. If you are the owner of one, or have any knowledge you want to share, WE WANT TO HEAR FROM YOU! The goal is to locate as many of the 150 as possible with the intent of publishing the number of the certificate and a general geographical location as demonstrated below. 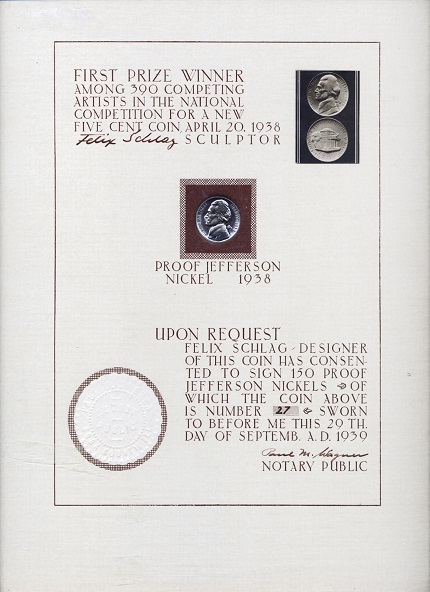 The 150 Jefferson Proof Nickel Commemorative Certificates assembled by Felix Schlag have been referred to by many different names through the years; for the purposes of this discussion they will be referred to as the “Certificates.” For the unfamiliar, the Certificates are printed on heavy cardstock measuring approximately 8” x 11”. 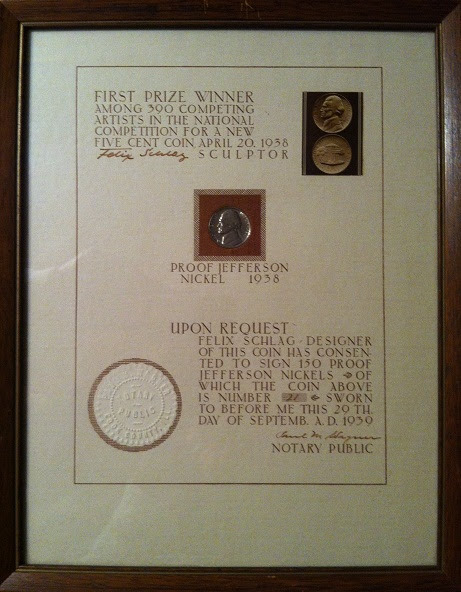 They contain a regular 1938 Proof Jefferson nickel, text referencing the open competition; include a photo re-print of Schlag’s original winning design, his signature, the serial number (x of 150), the mark and seal of notary public, Paul M. Wagner, and are dated September 29, 1939. For the coinage year 1938, the treasury minted 19,365 Jefferson proofs, of which an estimated 14,000 remain in existence today. 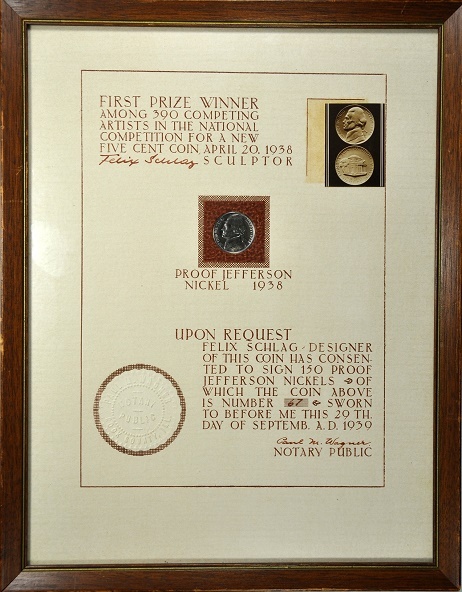 Records from the Medal Department of the Philadelphia Mint confirm that deliveries of proof coins began on November 15, 1938 and concluded on December 30, 1938. 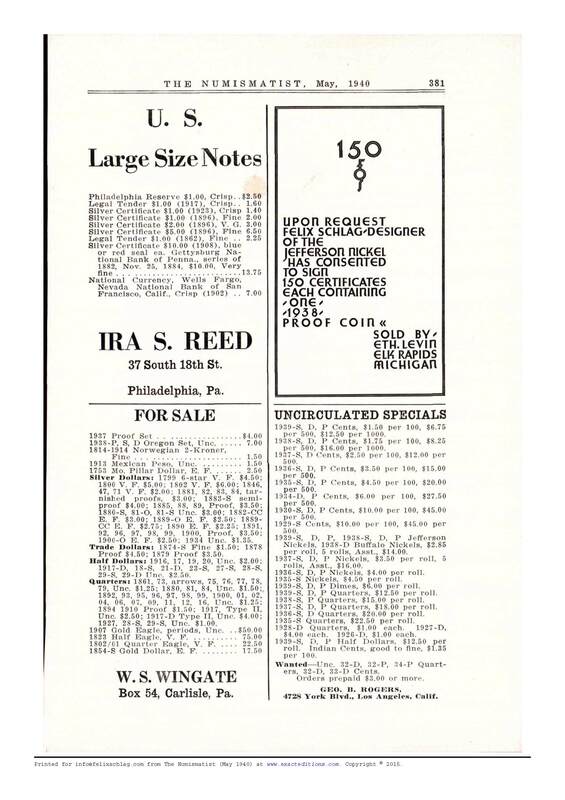 A letter from Eric Leavens in the March 1939 issue of The Numismatist confirms that only limited supplies of complete proof sets were available for sale at this time at a price of $1.81 plus 8₵ for postage and insurance. This is to acknowledge receipt of your order for one 1938 proof coin and cash in the amount of 28 cents enclosed. 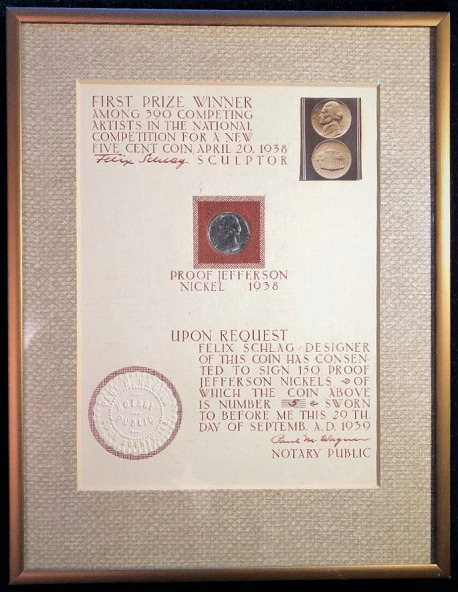 Please be advised that we are unable to fill your order for 1938 proof Jefferson nickel, as the 1938 proof coins we have on hand are a limited supply of full sets that are being held available for sale in sets only until sold. We will thank you for immediate advice as to whether you desire to increase your remittance to cover the cost of a full set ($1.81 plus postage and parcel post insurance 8c.) or to cancel your order. In the absence of an immediate reply your remittance will be returned to you in due course. 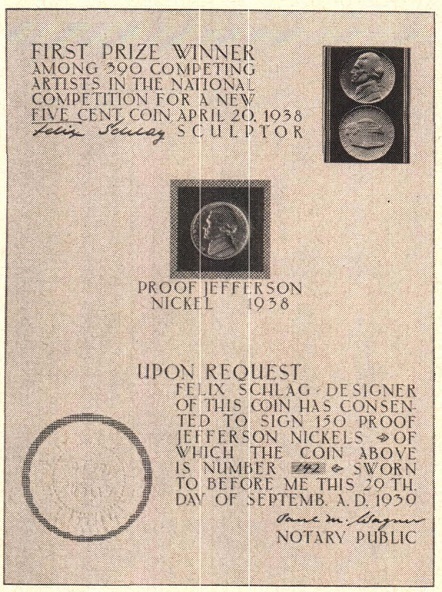 It was likely the summer of 1939, nearly a year after his initial requests, before Schlag was able to obtain at least some of the 150 proofs used in his Certificates. The first would have been a bag of 12 coins from the Philadelphia Mint fulfilling his initial $2.48 order from 1938 (proofs sold for 20₵ each plus 8₵ for postage and insurance). 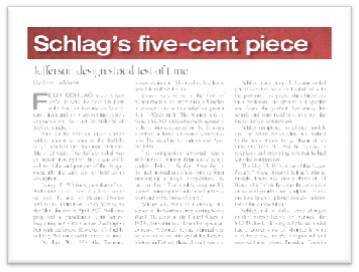 All told, Schlag spent a little more than $30 for the 150 proofs he used in the Certificates. Recall that during this time he was employed by the Works Progress Administration as a Senior Artist/Sculptor earning $1 per hour. As such, these coins equated to nearly a week’s worth of work. 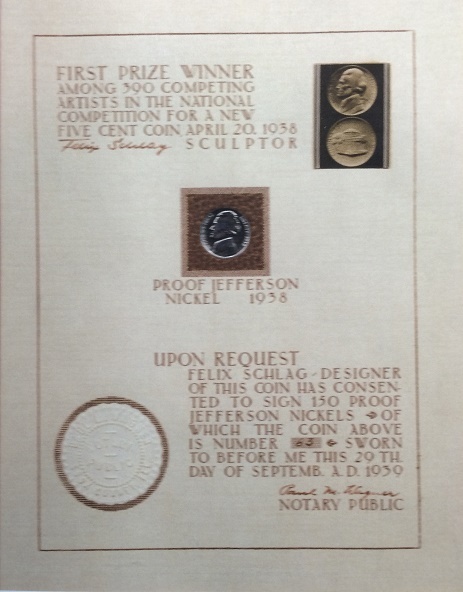 Had Schlag’s initial request for 2000 coins been honored, not only would he have been in possession of 10% of the total proof coins produced in 1938, but it would have cost him more than $400 or nearly 3 months wages! 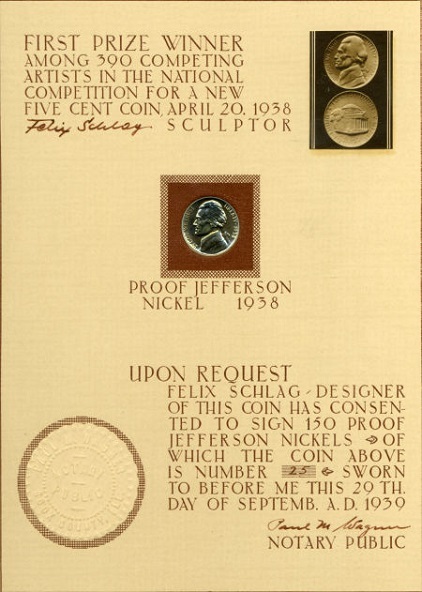 With proof nickels in hand, and the Certificate designed, Schlag had them printed and then assembled the pieces before having them notarized. The notary seal is that of a Paul M. Wagner. Genealogy records suggest that a Paul Mattison Wagner, born November 3, 1894 lived in Chicago, Illinois. Census records from 1930 and 1940 confirm that Paul Wagner was a Postal employee in Cook County. Unfortunately, the Illinois State Archives no longer possesses records of notary’s from this era, so further authentication of Wagner is not possible. An examination of the nickel specimens used in the Certificates reveals that they contain the serifs, first discussed by Tom DeLorey, (ANA LM-1696) in his 2009 piece, Mysterious Re-Engraving of 1938 Proof Nickel Dies More Extensive Than Previously Believed. DeLorey’s position is that 1938 proof strikes were distinctly different from business strikes in that they possessed serifs, likely the result of die changes being made just prior to changing coin years. The presence of these distinct characteristics on the coins used in Schlag’s Certificates suggests that they are authentic proofs. To gain insight into what Schlag did with the Certificates once assembled, we look again to the letter he wrote to Lee Martin in 1973. Initially Schlag gave them away to friends and relatives. Letters also confirm that Certificate #1 was provided to the Chicago Historical Society in November of 1939. He then had Ethel Levin, his eventual third wife, list them for sale in the May 1940 issue of The Numismatist. The advertisement yielded no sales. Ultimately, the remaining lot went into a box in his attic after he and Ethel, who were married November 22, 1940, moved to Michigan in 1941. Here the Certificates would remain for the better part of 20 years. In late 1963 or early 1964, Ethel reportedly took ill, and Felix sold the majority of the remaining Certificates to Earl C. Schill, a Detroit coin dealer. As many of the Certificates in the possession of Schlag’s decedents, are not framed, it is the believed that Schill is the one who placed them in the small, wooden frames which many are found encased in. 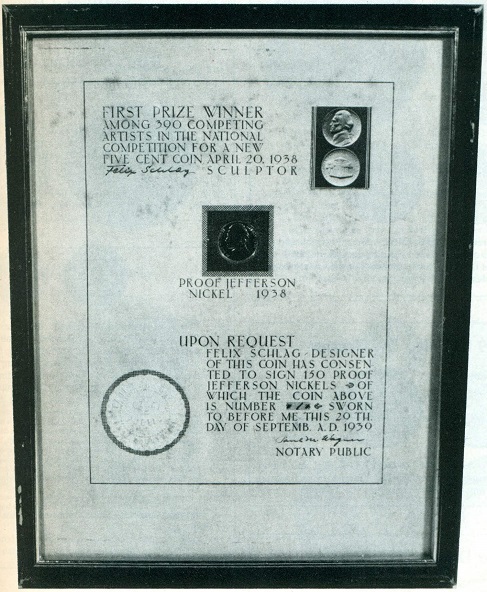 Schill launched a campaign to market and sell the Certificates with ads first appearing in the April 1964 issue of The Numismatist. The asking price was $225; adjusted for inflation that would equate to about $1750 in 2016 dollars. 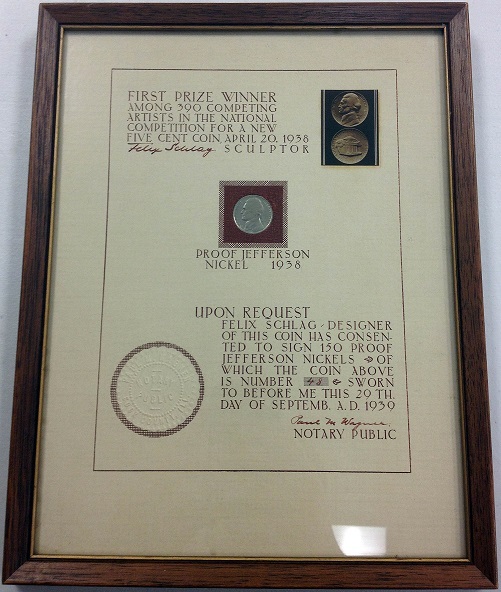 Out of the handful that Schlag maintained, he sent #3 to the American Numismatic Association in May 1968 where it remains today. 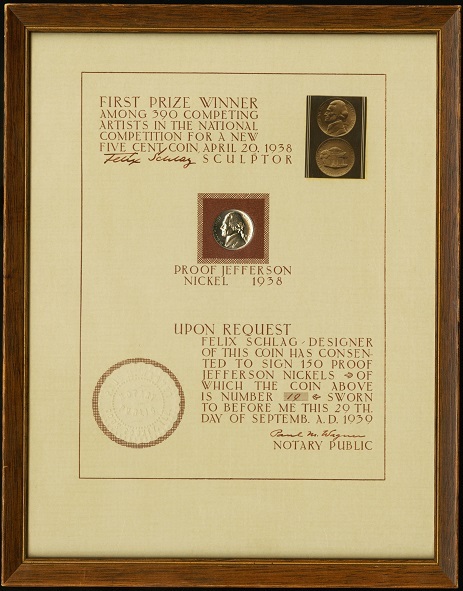 In your last letter you were curious as to the organization of the Certificate with the 1938 Proof Nickel. May I just reminisce now and set the mood for the background. My thoughts lately have retraced my past efforts; the factors and decisions which shaped and influenced my life. The movements and changes in environmental conditions and technology (either man-made or through the elements) have forced tensions upon humans resulting in many falling by the wayside, and others seeking new horizons, discoveries or adventures. I was caught up in the economic disaster 1929-30 in New York and felt an irresistible desire to change locations, looking for a better climate to find sculptural work. Rumors were, one could find a normal existence in Chicago. So I went by bus to a strange city, arriving after midnight on the South side, not knowing a soul. Lean, difficult years followed. I learned there is no situation worse than not knowing where the next meal is coming from or how to obtain money for the room rent. But the health of youth can survive much abuse, even periods of starvation. Life was hostile and a struggle for self-preservation. I had practically nothing. Sometimes I felt as though the ground had given way under my feet. But I also met and befriended gentle people; Italians (in the plaster field), Jewish friends, inviting me to their homes, giving me moral support, French, Polish, Germans, politicians of every faction. Artists lived in different sections of Chicago - in cluster groups. I can speak only about those around the North Avenue, Wells Street in the 1930's. They were a close-knit group, sharing knowledge and ideas bolstering each others' courage unselfishly. Compare that with a shallow sophistication too often found on a higher social elevation. In the unique hours of silent nights, when most are asleep, there is a certain mystic. It is a time that provides a kind of peace, a retreat from the agitation of life. Imagination holds full sway and gradually takes shape in the form of a vision of intuition which offers the artist a way to express his inner self. 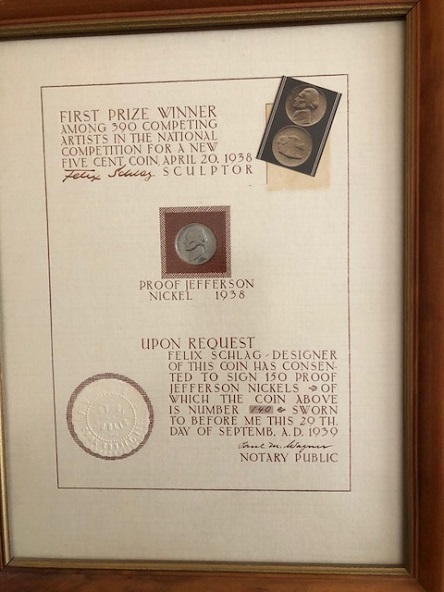 In this aura, the work of the Jefferson Nickel had its start. Bone weary, after a hard day, I worked nights only on this project, but curiously was always reluctant to quit. After winning the contest – our small group suggested that I should create a plaque to commemorate these years of deep, sincere friendship. I designed every letter by hand in the lay-out and had 150 printed. Some were given freely away at once. 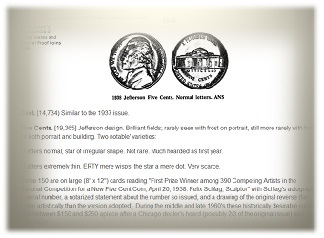 Number 1, I dedicated to the Chicago Historical Society who had favored me with help in my Americana research; Number 3 to the American Numismatic Association. 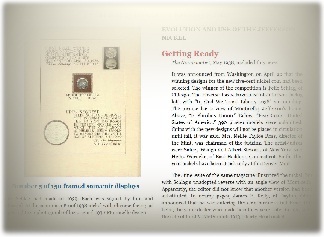 I placed an ad in a numismatic magazine, but did not receive one reply; no promotion was involved. So after moving to Michigan, I put them in my attic. 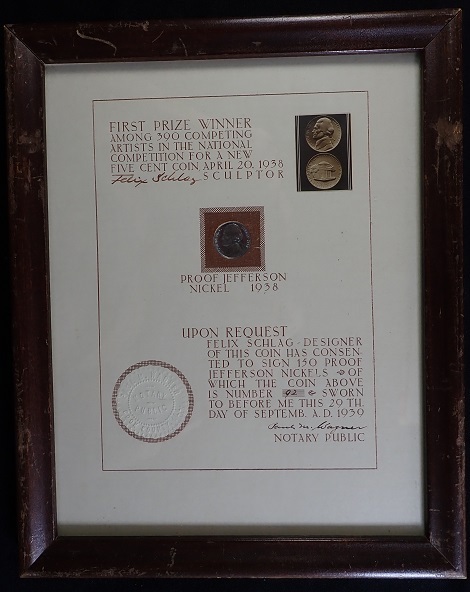 Many years later, when my wife became ill, I cleaned out many belongings and included the Certificates with a small coin collection which I sold. You might say I gave the Certificates away for nothing. The dealer put on an advertising campaign, and to my amazement I heard from a Physician later who told me of paying $300 for one. I kept a few of the Certificates for myself and my wife. Thank you for your patience in lending an ear to this story of MY DEPRESSION. People have come a long way since then; unbelievable changes in attitudes and habits. Personal regards to you and your family. For those seeking further confirmation of the authenticity of these items, references to them may be found in well known coin books and magazines. "Number 5 of 150 framed souvenir displays. Felix Schlag had made in 1939. Each was signed by him and notarized. 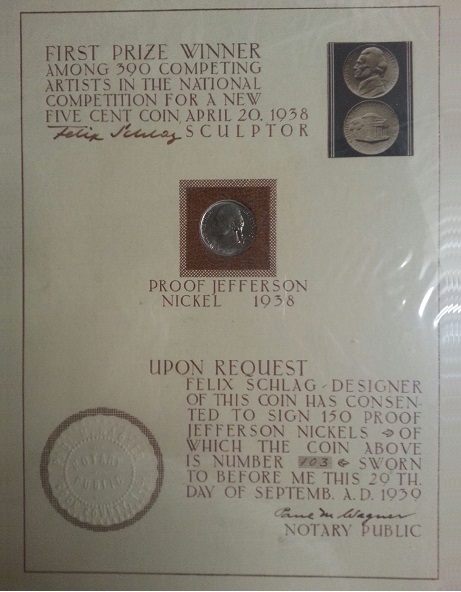 At the center is a Proof 1938 nickel with obverse facing; at upper right is a photograph of his original 1938 Monticello design." -The Official Red Book a Guide Book of Buffalo and Jefferson Nickels: Complete Source for History, Grading, and Values (Official Red Books) by Q. David Bowers. Whitman Pub Llc (January 30, 2007). Chapter 7. "Some 150 are on large (8" x 12") cards reading 'First Prize Winner among 390 Competing Artists in the National Competition for a New Five Cent Coin, April 20, 1938. Felix Schlag, Sculptor' with Schlag's autograph, a serial number, a notarized statement about the number so issued, and a drawing of the original reverse (far better artistically than the version adopted). During the middle and late 1960's these historically desirable cards sold between $150 and $250 apiece after a Chicago dealer's hoard (possibly 2/3 of the original issue) was dispersed." -LaMarre, Tom. "Schlag’s Mr. Jefferson. Nickel has historic appeal." Coins Magazine May 2011. Pages 30-32. 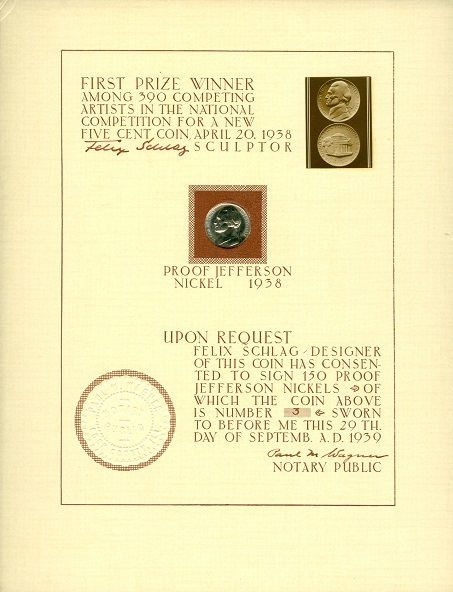 "In addition to business-strike nickels for circulation, the Philadelphia Mint struck proofs for collectors. 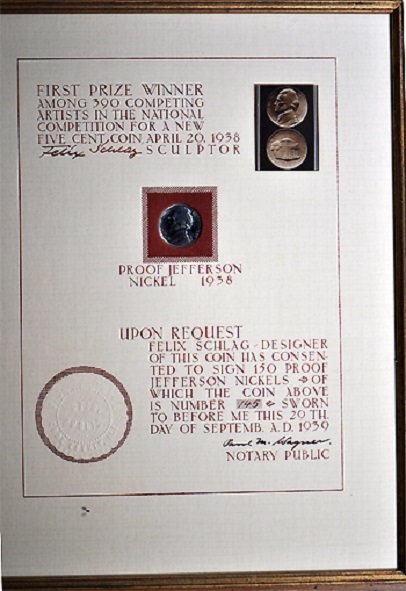 Schlag acquired 150 proof 1938 Jefferson nickels and mounted them on notarized plaques with his autograph and photos of his original plaster models." -LaMarre, Tom. 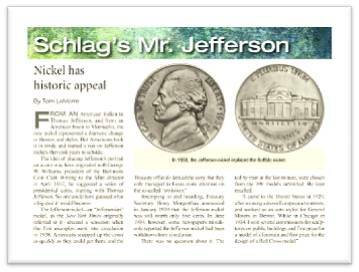 "Schlag’s Five-Cent Piece: Jefferson design stood test of time." Coins Magazine July 2013. Pages 18-20, (Digital Download). 1 California 1990 Last seen: Bowers & Merena auction January 1990 item #94. 3 Colorado 2014 Last seen: 2014, confirmed certificate is still in possession of A.N.A. 2008 Last seen: Stack's Bowers during the Rich Uhrich Collection sale (February 2008). 48 Indiana 2013 Last seen: 2013 email from owner. Originally purchased in August 1966 from Earl Schill. 63 Florida 2016 Last seen: Email from owner in 2016. 66 California 2013 Last seen: Email from owner in 2013. Decedent of Schlag's sister. 2016 Last seen: Stack's Bowers Baltimore sale (November 2016 Lot #4067). 87 Massachusetts 2016 Last seen: Email from owner 2016. Last seen: Displayed on http://coinsite.com/1938-nickel-jefferson/. Site owner indicates it was in his possession from 1979 to mid-2000's. 2014 Last seen: eBay September 2014 (Item #: 161408535354); Previous owner bought at yard sale then sold to coin dealer who eventually sold on eBay. 132 New Jersey 2018 Last seen: Email from owner in 2018. 133 California 2014 Last seen: Sold on eBay May 2014 (Item #: 201082425707). Sale terminated. Still with California owner. 140 California 2018 Last seen: Email from owner, belonged to his father; unknown purchase date. Will likely be auctioned soon. 1964 Last seen: Used in the June 3, 1964 issue of Coin World Magazine. 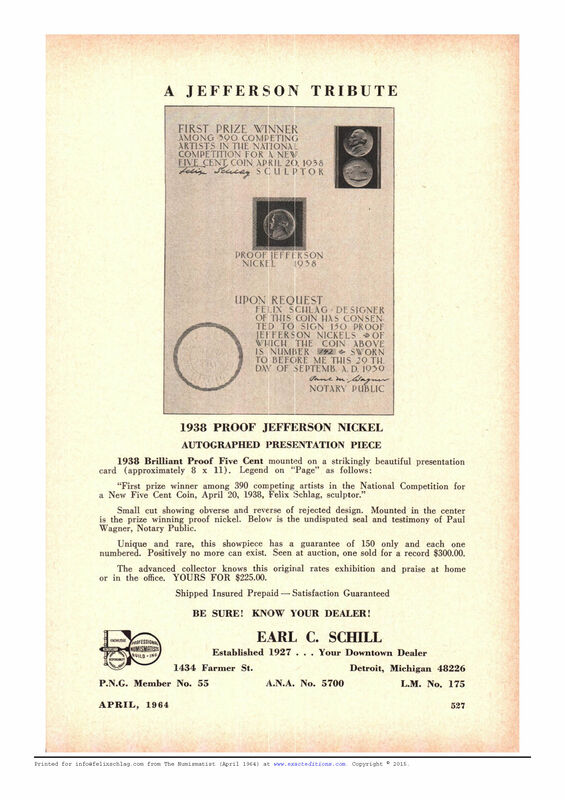 Featured in an advertisement for Earl Schill, a coin dealer in Detroit, Michigan.